Your industrial laundry wastewater treatment operation depends on throughput: Sludge in, filter cakes and filtrate out. If everything’s running smoothly, cakes are tight and dry, and filtrate meets regulatory limits. Your company makes money. Everybody’s happy. But what if everything’s not running smoothly in the dewatering shop? A bad filter press run, with cakes the consistency of oatmeal and filtrate that’s not much different, can spell trouble. Big trouble, in the form of a slowed down process, lost time, lost money, and maybe even a municipal fine. Not good. Nobody’s happy. So how can you avoid problems, see them coming, or at the very least, troubleshoot them quickly when they happen? Here are four questions you can ask yourself to make sure your process is getting the best results. For questions and order information, call 844-450-2920! 1. Are you running a clean machine? 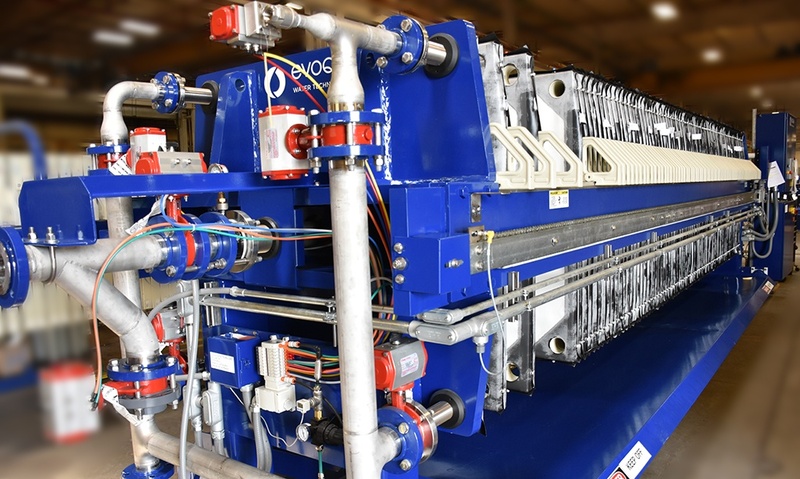 Filter presses like the line of J-Press® filter presses by JWI®, an Evoqua Water Technologies brand, are relatively uncomplicated machines, and they run reliably, shift after shift, day after day. When they fail to produce tight cakes and clean filtrate, one of the first places to look is the condition of the plates and filter cloths. Are they free of caked sludge? Do they allow the press to fill and operate evenly, or are there blockages in the flowpath that could prevent an even fill? Uneven fills can result in leaks and failures when the system is under pressure. Poor filtration is often the result. 2. Are your cloths wearing a little thin? If you’ve cleaned and/or power washed your press and everything looks good, the second most important thing to check is the filter cloth array. Cloths do wear out (lifecycle varies with use and sludge type). You can see the wear when you clean and inspect the cloths. It looks like thin spots. When cloths are worn, solids get through and threaten filtrate quality. Non-compliance could result, and that’s expensive! Evoqua stocks filter cloths that will fit most major brands for fast replacement. If you’re not sure you have the right cloths for the job, our Filter Press Lab can check your filters for you, analyze your process conditions, and recommend the right solution. 3. are you handling the pressure? All too frequently, filter presses fail because they’re not being pressurized according to design. Every manufacturer, including Evoqua, specifies that, for proper throughput, sludge must be fed by the pump in stages. But that takes time. And in a busy dewatering operation, who’s got the time? When you open the valves at 100% pressure, all in one step, you might save a few minutes. But those few minutes could cost you down the road. Fed at 100% pressure from the get-go, a press is likely to fill unevenly, resulting in poor filtration and more frequent cleanings. Overpressuring can even cause the plates to break. Then it’s time to call 911. If this is a frequent problem in your dewatering operation, you might consider an Automatic Pressure Control option on your press. With this system, a standard option on Evoqua filter presses, controls regulate the pump flow to the press in 4 stages. Properly set, this combination provides near-optimal propagation of feed flow to the press, improving cake formation and press performance. This allows your process to fill evenly — and frees you to tend to other needs in your dewatering process (and there are often many things happening at once, all of which seem to be Priority 1). 4. is it one of those upstream/downstream things? If your press is clean, your cloths are clean, and you’re managing feed pump pressure to fill the press evenly and correctly, and you’re still having problems with filter cake consistency, the next place to look is your process — that is, every step leading up to dewatering. Did something change? A soap or additive? Did your waste stream change? Even small changes in sludge type can affect press performance a lot. Evoqua’s lab services can help you with this. We have relationships with all of the major chemical suppliers, plus a complete filtration lab that can analyze your sludge and make process and equipment recommendations. keep it simple. and call evoqua. When your press is down, time is of the essence. A few simple steps, with a logical troubleshooting flow, can help you get to the root problem and resolve it quickly. Remember that, in addition to supplying and servicing your equipment, Evoqua has some of the industry’s best brains available to work through it with you and get you back online in no time. Because, let’s face it. You’ve got other, more “pressing” needs. If you have a filter press that has the name: J-Press, Siemens, USFilter, Perrin, Passavant, Edwards & Jones, IPM, or CPC we have all your original drawings, manuals and specifications! 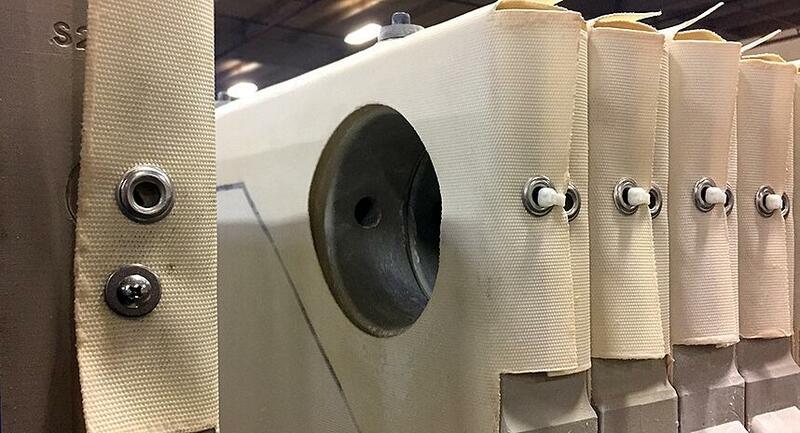 If your filter press has a different name on it don't worry - we can fix, repair or refurbish it, too!